Broken Wagon Ranch, sprawling over 1,353+ contiguous, conserved and breathtaking acres, is the perfect place to rest your wagon and explore a Colorado mountain paradise. The views of the north face of majestic Pikes Peak will stop you in your tracks. Stands of color aspens and conifer pines paint this landscape rich with rolling grasslands, a 3+ acre stream-fed lake (Lake Beatrice), several ponds converging into sub irrigated hay meadows an, granite outcrops. The area is a diverse habitat for area wildlife like trophy elk, deer, black bear, coyote, badger, bobcat, mountain lion, bald and golden eagle, turkey, and horned owl. Two creeks with water rights cross the property – Trout Creek provides irrigation rights to 55+ acres meadowlands that produce approximately 1 ton hay / year and Williams Creek provide water rights for Lake Beatrice. There are also several springs and small ponds dotting the ranch. Water rights for all wells, the lake and meadows will transfer. You will find remnants on the ranch dating back to the 1800’s that include a portion of the Colorado Midland Railway, the flag stop townsite (now abandoned) of Edlowe, and one of the earliest known snow skiing facilities complete with ski jump and runs. Improvements include a charming 2-bedroom cabin overlooking Lake Beatrice, two small rental homes, corrals, barn, and other outbuildings as well a complete perimeter fencing. 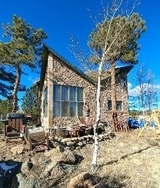 There are building pockets positioned to take in the magnificent backdrop of Pikes Peak or one of its numerous valleys. Placed in a conservation easement long before it was a popular notion, the original owners saw the values of ranching, forestry, agriculture and water conservation and ensured these concepts would be preserved for years to come. Currently operating as cow-calf cattle ranch (averaging 60-75 head), it is a true family retreat blessed with awe inspiring views, outdoor recreation, and privacy with easy access from paved county roads and less than 3 miles from town. This harmonious blend of assets depicts a true Colorado landscape and a promotes the concept of life on the land – western style!